Chesley Fence & Deck proudly installs composite decking for homeowners in O’Fallon, Illinois, and the surrounding communities. Our goal is to provide our customers with the greatest value for their money when they invest in a new deck, while also offering a wide range of styles, which is why we offer a range of premium composite options. All of these options feature the natural warmth of genuine wood without any of the drawbacks, such as rotting, splintering, and termite infestations. However, we typically recommend our Tamko EverGrain® Envision® composite for homeowners who want to know which of our options is the best. 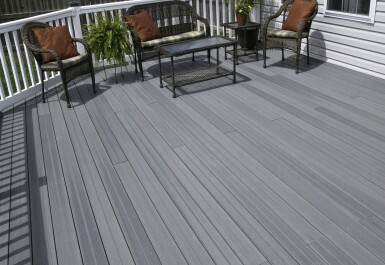 This top-of-the-line deck is exceptionally durable and easy to maintain. Plus, you can rest assured that it will keep its beautiful appearance long into the future because it comes with a 20-year warranty that covers deterioration, staining, and fading. By turning to Chesley Fence & Deck for composite decking, you’ll not only receive the industry’s best products, but also the finest service. Having served area homeowners since 1967, we have the experience to install your deck in any configuration and to do so with exact precision. We earned an A+ rating with the Better Business Bureau and are recognized as the area’s most trusted name in decking because we are completely committed to customer satisfaction. If you’d like to learn more about the composite decking we install in O’Fallon, IL, contact Chesley Fence & Deck today. Don’t forget to ask about the financing options we have available to qualified homeowners.